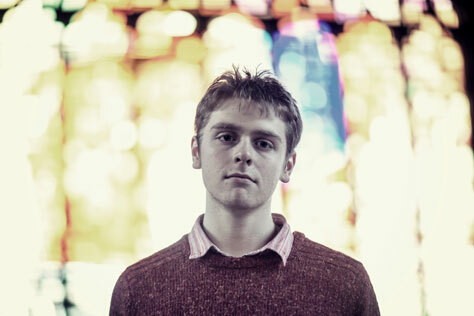 We’re delighted to be working with Kiran Leonard once more! Kiran Leonard is a mercurially talented 19-year-old musician from Oldham, Greater Manchester. His debut double album, Bowler Hat Soup, was released in late 2013 as an original limited run of 300 vinyl copies, and his music has won acclaim from publications as diverse as the Guardian, NME, Pitchfork, The Line Of Best Fit, The Quietus and Mojo. Kiran Leonard has announced a new tour for spring, with five March headline shows including a date at Manchester’s Gullivers. Kiran will be ably backed by his permanent band which made their debut almost a year ago at the BBC Radio 6 Music festival, and will be performing songs from his forthcoming new LP Grapefriuit (release anticipated later this year). Kiran has also shared a brand new EP Terreiro do Paço, available from his Bandcamp page now. In addition to new songs, it features a cover of Washington Phillips‘ Mother’s Last Words To Her Son (1927) and an guitar electric guitar rendering of A Purpose, which first appeared on his debut double album Bowler Hat Soup. Main support comes Jonnie Common. Jonnie Common makes some of the strangest noises ever to be combined into such catchy, digestible pop songs. His first album, Master of None, came out on Manchester-based imprint Red Deer Club in 2011 and its combination of pathos, humour and charm made it a firm favourite, particularly amongst the Scottish underground music scene. New album Trapped In Amber, released on Edinburgh’s Song, By Toad Records, showcases an evolution in production and perhaps in perspective. A little less naive but no less eloquent, the album deals with a wide range of topics from roman history to cancer to lawn maintenance. Opening the show are Manchester trio Hot Shorts, who released their debut EP, Web Design, last year.